Emory has certainly changed since Harry Rusche arrived as a newly minted English Ph.D. in 1962. That was the year the University successfully sued to be able to racially integrate, though it would take another year to be reflected in the student body. At the time, Emory had been co-educational for just nine years — and was nearly two decades away from morphing into a nationally ranked research university. Rusche, however, has remained much the same as the 26-year-old who first became an English professor during the Kennedy administration. He retires this year after 54 years of teaching, never wavering in finding new ways to link his love of language to his drive to inspire students. "I never devoted myself to a book," Rusche says. "Our undergraduates are so very bright. My focus has always been to find ways to engage them. What I teach them is all news to them, but it must be exciting news, because they write such amazing pieces." As he speaks, Rusche glances at a pink Post-It stuck to his Callaway office door. A recent graduate, on a long layover in Atlanta, had scrawled his surprise at finding Ruche's legendary open door closed but promised that he would be passing through again soon so they could connect for lunch. "That just happens," Rusche says with a shrug. "I like the students, and they like me." Great teaching has long been a hallmark of Emory College's liberal arts education. Rusche has twice received official recognition for his commitment in the classroom. He earned the Emory Williams Distinguished Teaching Award in 1987 and held the Arthur M. Blank Distinguished Teaching Professorship between 1992 and 1996. More recently, Rusche received the 2012 George P. Cuttino Award for Excellence in Mentoring. He is proud of the awards, he says. But when he talks about those and other accomplishments, they always boil down to instilling a love for words and writing in students. Consider that he will tell you he has always preferred the physical act of putting pen on paper to capture thoughts in writing. Yet in 1987, Rusche won an Apple grant for 20 MacIntosh computers, for use in an introduction to writing class. Rusche saw that the computers offered instructors real-time supervision of student work. The boxy Mac II —one of which still sits in Rusche's office — also let students work and learn together on projects. His work was instrumental in what's now known as computer assisted instruction (CAI). And the room where that introductory class was held is now the Emory College Writing Center. "The guy really lives and breathes for his students," says Dan Bobier, a 2013 English and political science graduate who counts Rusche as a mentor. "He really wanted to know who we are and who we wanted to be." It was Rusche, Bobier says, who encouraged him to take a challenging class on "Paradise Lost" with English professor Jonathan Goldberg. Students would spend the entire class arguing about the meaning of a single word in the text, Bobier recalls. Then Bobier would meet with Rusche to debate the nuance of each possibility. The intellectual musings, sometimes over meals at Rusche's house where they compared life growing up in southwestern Ohio, did more than help Bobier with his honors thesis on Milton. Now a third year law student at Stanford, Bobier excelled while watching some classmates struggle in a white collar crime class that focused — again — on understanding the meanings of a single word in statutes. "It's actually a serious, cerebral area of law," Bobier says. "I'm planning to go into white collar work in recognition of the type of analysis that Harry helped me refine. The man is always mortified by any recognition, but my plan is really a credit to him." 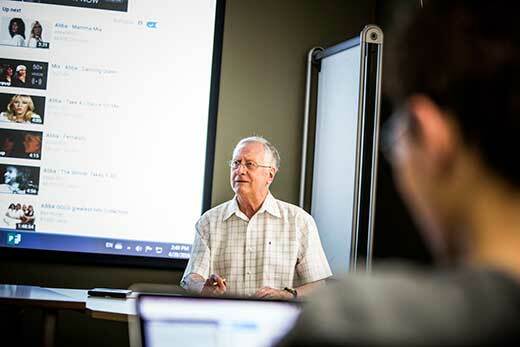 Ask Rusche and he says simply that Emory has given him great students, open to his brand of teaching. Rusche earned his bachelor and master's degrees from the University of Cincinnati in an era when students immersed themselves in the Western traditions of art. That's how a serious literature student happened to attend an art restoration and meet a similar minded thinker, Sue, who became his wife the year he came to Emory. That early exposure to the arts created a lifelong interest in museums in general and, specifically, in the decorative appeal of postcards. In the classroom, that means his tools extend beyond the expected dramas from Shakespeare, poetry from Edmund Spenser and verse by John Milton. The postcards — thousands of them carefully cradled in stacks of binders — are far less obvious. "It's kind of fun when you can take your hobby and your job and make them one," Rusche says. Some depict life during World War I, a particularly prolific time for some of the poetry he teaches. At least 1,000 show legendary actors and scenes from 19th and early 20th century theatrical productions of Shakespeare's works. Rusche scanned and researched the cards and turned them into three separate websites: Shakespeare and the Players, Shakespeare Illustrated and The Great War, 1914-1918. The effort put Rusche in the vanguard of digital scholarship in the 1990s, at a time when few beyond him recognized the impact it would have. He recalls one colleague dismissing the websites when talking about having published a scholarly book. At the time, Rusche's two Shakespeare sites were getting about 375,000 unique visitors a year. "I said, 'Do you think your book is pulled down 375,000 times a year?'" Rusche says. "I saw what it could do online, and now it's a resource for a lot of people." Even after he retires, that legacy will keep him out front on Shakespeare scholarship. Emory's Center for Digital Scholarship recently redesigned Shakespeare and the Players, and some of the pieces are being exhibited in Woodruff Library. Rusche expects he will do a bit more updating before this fall's exhibit of the First Folio on campus. "It's all for pedagogy," Rusche says. "I'm glad people find it useful, but for me it's fun. And it's a powerful tool for teaching." It takes more to develop a Rusche-level following than just researching postcards or lecturing about "The Faerie Queene." As a student at Emory, Jake Kim noticed a poetry course taught by Rusche that was already filled to capacity, but tried to get in anyway. Kim, then a junior returning to Emory after compulsory two-year military service in his native South Korea, emailed the professor asking to get in. No dice. But an alumna who Kim knew urged him to try again. Kim says he emailed Rusche in desperation and wrote, "If not having enough seats is the issue, I am willing to stand the entire semester." Not surprisingly, the professor relented. And Kim took advantage of the break by making sure he participated in every class. He rapidly formed a deep friendship with his professor. Rusche, he says, would sometimes ask if he'd done a "good job" teaching that day. To Kim, it was a sign that his professor genuinely cared. He became an English major and decided to take one course with Rusche every semester until he graduated in 2014. He also persuaded Rusche to supervise his independent study project on World War I, using some of his professor's postcards for research. Kim was the first international student to win a significant English scholarship at Emory — the one named for Rusche and his wife, though his professor was not on the selection committee. "My experience at Emory could not have been the same without Dr. Rusche," says Kim, who interned with Sue Rusche's nonprofit, National Families in Action, after graduation and now is an international recruitment specialist at the University of Nebraska at Kearney. "Dr. Rusche has shared with me repeatedly he thinks of me as his own son, and I, too, think of the Rusches as family," Kim adds. "What an honor." Rusche praises so many of his former students, it can be hard to keep track when he rattles them off. "Some of the brightest students I've ever taught are here now, or just left," he says. There was the neuroscience major whose essay about researching biology's role in addiction still sticks with him. Several recent Buddhist and Muslim students, without prompting, brought new insights to the Biblical allusions in "Paradise Lost." Or maybe it was the students who kept him abreast of social media trends — yes, he's familiar with Snapchat — and what CW show he should watch when he finishes his next foreign film based on Shakespeare. "The first thing I'm going to do with myself in retirement is binge on all these Vampire Diaries shows. And I've got to catch up on Teen Wolf," he says. "Oh, and I have to catch up on the DC and the Marvel superhero movies." "I love watching new films based on Shakespeare, because they always do something you don't expect," Rusche says. "I love seeing that in superhero films or on TV. It's cultural literacy. You learn it, and then that's how you teach. "I'm retiring but I'll be messing around, one way or another," Rusche says. "Learning, teaching, it is not something you just give up."